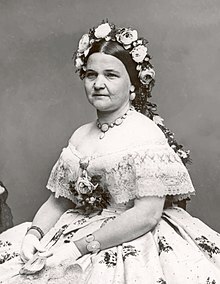 Mary Ann Todd Lincoln (née Todd; December 13, 1818 – July 16, 1882) was the wife of the sixteenth President of the United States, Abraham Lincoln, and was First Lady of the United States from 1861 to 1865. She was born in Lexington, Kentucky. Her father was Robert Smith Todd and her mother was Eliza Parker. Her parents were prominent residents of the city. Mary's paternal great-grandfather, David Levi Todd, was born in County Longford, Ireland, and emigrated through Pennsylvania to Kentucky. Her great-great maternal grandfather Samuel McDowell was born in Scotland, and emigrated to Pennsylvania. Other Todd ancestors came from England. When she was around twenty years old, Mary came to Illinois where her sister Elizabeth lived. There she met Abraham Lincoln. He was a young lawyer at that time. She married Abraham Lincoln on November 4, 1842. The last person known to be of direct Lincoln lineage, Robert's grandson "Bud" Beckwith died in 1985. Mary Lincoln was well-educated lady. She was also interested in public affairs. She also shared her husband’s ambition. At times, she became touchy and irritated. The newspapers sometimes criticized her for spending the government’s money to buy new furniture for the White House. She went to the hospitals during this time, to help wounded soldiers. After the assassination of her husband in 1865, the death of her two sons, Willie and Thomas, had made her very sad. She became very depressed. His son Robert wanted to take control of his mother's money. He sent his mother to an insane asylum. After three months, she was freed. She never forgave her son. She spent about four years in France in a city named Pau. She also traveled to many parts of Europe. During her last years, her health became very weak. In 1879, she suffered spinal cord injuries when she fell from a stepladder. She also got cataracts and her eyesight became weak. During the early 1880s, Mary Lincoln was confined to the Springfield, Illinois residence of her sister Elizabeth Edwards. She died there on July 16, 1882, at age 63. She was interred in the Lincoln Tomb in Oak Ridge Cemetery in Springfield alongside her husband. ↑ Mary Lincoln. Firstladies.org. Retrieved on 2014-01-11. Wikimedia Commons has media related to Mary Todd Lincoln. This page was last changed on 8 February 2018, at 08:43.